Already own a home in the North Pine Place subdivision? Thinking of selling? Click here and read about current search trends & our web network. North Pine Place subdivision in located just North of downtown Foley, AL and West of the Foley Beach Expressway. 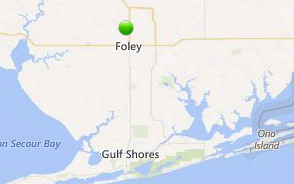 The Foley Express road was connected all the way to I-10 in September of 2014 joining Orange Beach, AL to I-10 in the Wilcox area just East of Loxley, AL. This connection makes the drive from I-10 to the Gulf Coast beaches much quicker and through much less traffic making the entire area more accessible. The trip from Orange Beach to the regional airport in Mobile, AL can be traveled in about an hour. North Pine Place subdivision is in between these two areas and now a much more conveniently located community. North Pine Place is a short drive from downtown Foley and all of the restaurants, shopping outlets and entertainment venues located in the Foley area. Please let us know if you would like additional info such as, pictures, subdivision bylaws, recent sales figures by emailing info@condoinvestment.com or call (251) Area-Pro (251-273-2776) for immediate assistance or to schedule appointments to view current listings in North Pine Place or other properties in the area.